In late 2007, I raised the question of how Muslims would respond to Barack Obama, a born Muslim, were he elected president of the United States.During the U.S. presidential campaign, Muslims knew they liked Barack Obama but puzzled over his present religious status. As I put it in August 2008: "They resist his self-identification as a Christian while they assume a baby born to a Muslim father and named 'Hussein' began life a Muslim." Indeed, the Iranian leadership indicated a preference for Obama, while Ahmed Yousef, a Hamas operative, actually endorsed him: "We like Mr. Obama, and we hope that he will win the elections." Well, they got their way. This weblog entry reviews some prominent and interesting voices on this topic. Arab and Muslim fascination with Obama rests on the idea that he is their Trojan horse into the highest office in America, the gleeful whispers describe him at times to be a secret Muslim, and in another light, an 'anti-imperialist' leftist. Obama will be pitched as a proselytizing Christian infiltrator into the land of Islam, rather than a secret Muslim in the White House. Obama the apostate had turned his back on his Islamic birthright and early childhood for the opportunism afforded by Christianity, and that is America's grand plan for fixing the Middle East: turning it Christian—or so goes the conspiracy theory. … It is only a matter of time before Obama's biography, once thought to be the harbinger of international goodwill, will be distorted into yet another reason to hate America. Divided opinions: I review the surprisingly mixed immediate responses to the U.S. presidential election at "Obama Wins, Muslims Divided." Being the son of a Syed, the President-elect himself is Syed. Syed Barack Hussein Obama, will do well to remember this, as his greatest honor in order to continue to make his mark in the tradition of those who, whether they are following Islam as good Muslims, or even adhering to the Ten Commandments as good Christians, are known by the characteristics of generosity, chivalry, and patience. See him as a Shi'ite: Ridha Mohammed, a Shi'ite engineer trained at Baghdad University learned that the reporter he is speaking to is American and lowered his voice: "I will tell you a secret that the Americans don't know. Their next President is a Shi'ite." Bobby Ghosh of Time magazine reports that "conspiracy theorists across the Middle East have embraced the idea [of Obama being a covert Muslim] with the same fervor they bring to other bizarre notions." Another Iraqi, named Mohammed, says that "When Obama won, it was a big day in [the Shi'ite section of Baghdad called] Sadr City. Many people felt, 'Now we have a brother in the White House'." Ghosh ascribes the notion of Obama as a Shi'ite traced to the Iranian government. In the run-up to the U.S. presidential election, state-run papers published articles claiming that the Democratic nominee's paternal ancestors had hailed from southwestern Iran. In reality, of course, Obama's father and his ancestors came from Kenya, where Shi'a Islam is rare. Most Kenyan Muslims are Sunnis and leaven their faith with pre-Islamic African traditions and beliefs. Obama himself has said he has no idea if his paternal grandfather (who converted from Christianity) was Sunni or Shi'ite. 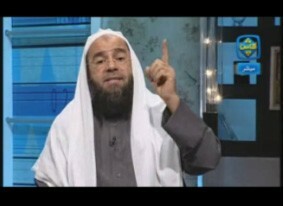 Hassan Abu Al-Ashbal, an Egyptian Islamist, offers Obama three choices. Convert to Islam or else: An Egyptian Islamist, Hassan Abu Al-Ashbal, launched a three-part appeal to Obama: convert or do what we want – or else. Speaking on Al-Nas television on November 27 (as recorded and transcribed by MEMRI), Abu Al-Ashbal starts by comparing Obama to "the Byzantine leaders in the days of Prophet Muhammad," implying that he is a non-Muslim leader whose country will eventually give way to Islamic rule. I invite him to convert to Islam. This is the call of the Prophet and of Allah. Oh Obama - convert to Islam, and you will be saved. Such an appeal is standard enough rhetoric, though not usually directed to American politicians. I hope that Allah will reward you twice: once for converting to Islam, and another reward for all those who will convert in your footsteps. Here, Abu Al-Ashbal recognizes what a big catch Obama would be – his example would cause many others to emulate him and convert. You, Obama, are among those who have pledged before Allah - Allah who created you, sustained you, and brought you to this position - to be a Muslim who believes that Allah is the one God, especially since you have some kind of roots in Islam. "Some kind of roots in Islam" rather neatly sums up the prevailing state of confusion. Everyone knows there is a connection, most are unsure what exactly it is. If you refuse to return to your [Islamic] origins, to the way Allah created you, withdraw your huge armies and military bases from the lands of the Muslims. Okay, don't convert, Abu Al-Ashbal says, but at least do what we Islamists want you to do. If you refuse, Obama, and insist on remaining in Muslim lands, know that Allah still plants in [Muslims] obedience to Him, and that they are willing to wait for Paradise, which is closer than their own shoelaces. Know, Obama, that in the lands of Islam, there are people who seek death, and are eager for it, even more than you and your people are eager for life. The war of the Crusader camp is currently being led by a black slave, an apostate from Islam. Praise Allah, [the Christians] could not find anyone to lead them, so they borrowed an apostate slave – in order to become [truly] deserving of Allah's wrath, his revenge and his quick punishment." Hizbullah guide pans Obama: Mohammed Hussein Fadlallah, 73, Hizbullah's long-time spiritual guide, says that Obama's outreach to Muslims has not changed the basics and that he perceives the policies of George W. Bush re-emerging. The U.S. administration is gradually regaining its previous image under the Bush administration by dealing with Iran's nuclear issue in a way that ensures permanent support for the Israeli entity, which pays no heed to all international laws, particularly those related to the acquisition of nuclear weapons. … We tell the Americans who come to occupied Jerusalem to reassure the (Israeli) enemy ... that within a limited period of time you have almost foiled all the objectives which your president tried to achieve in his calculated speeches to the Arab and Muslim worlds. 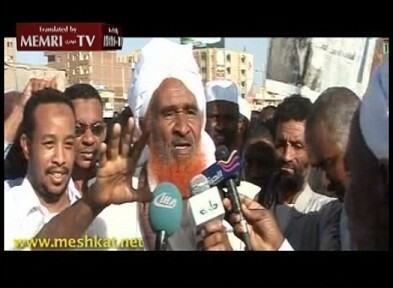 'Atiyya Muhammad Sa'id, a Sudanese 'alim. By God, the state of Islam will be established upon the land, whether the infidels like it or not, whether the Jews like it or not, whether that apostate - what's his name – the one from America – Obama [likes it or not]! Obama is a Muslim who has left the fold of Islam. Hence, Allah, the angels, and all the people curse him. He is a real apostate. Obama is an apostate. Obama is an apostate. He left the fold of Islam. 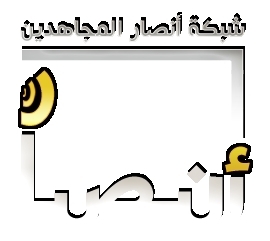 The Ansar al-Mujahidin Network logo in Arabic.